So, you’re moving into a new office space. Congrats! Your business is on the rise, the team is expanding, and it’s time to relocate operations to a building with a bit more scalability. We get it; we’ve been there. In all of the excitement and the flurry of new office purchases, one of the last things you thought about was the signage you’d need to pass inspections. Perhaps, you didn’t even know particular signage was needed to be compliant. Now, you risk setting back your moving date or receiving a hefty fine from your inspector for the gaffe. Relax. We’ve got you covered on everything you need to know related to Braille Signage and staying compliant with ADA Guidelines. In order to fully understand the importance of ADA Braille Signage, we need to take it back to 1990 when the United States Congress passed The Americans with Disabilities Act, effectively implementing regulations by which society would conform to the needs of the physically disabled. The law made efforts to prohibit discrimination and ensure equal opportunity for disabled individuals in employment, government services, public accommodations, commercial facilities, and transportation. The efforts that were made in commercial facilities are what you need to be primarily concerned with as it comes to interior office signage. The original 1990 Act was a landmark victory for Americans living with disabilities, and helped to create an American society that was more inclusive and accommodating to those living with physical or mental impairments. Amended in 2008 to cover an even wider range of disabilities, the Act still holds prominence in today’s society. As it concerns the topic of signage, one of the most important revelations was the 2010 ADA Standards for Accessible Design (ADAAG) which created a braille standard for ADA signage in offices and public dwellings. In order to fully understand how ADA-Compliant Braille Signage applies to your business, let’s first break down the variables related to these signs. Who do ADA Regulations apply to? State and local government facilities (including schools, hospitals, public facilities, public housing, courthouses, and prisons), places of public accommodation (including stores and shops, restaurants and bars, sales or rental establishments, service establishments, theaters, places of lodging, recreation facilities, assembly areas, private museums, places of education, and more), commercial facilities (office buildings, factories, warehouses, manufacturing plants, and other facilities whose operations affect commerce), and transportation facilities (buses, vans, rail cars, planes, etc.). The only exemptions to ADA signage regulations are the same types of organizations who have historically been exempt from federal laws – including religious entities, and private clubs. What constitutes a compliant ADA Braille Sign? A compliant sign is one that adheres to rigid guidelines related to sizing and coloring, has raised text for the lettering and image, and includes braille. For a more thorough understanding, please access the ADA Braille Sign Requirements section directly below. When are ADA signs required within a building? ADA signage is only to identify permanent rooms, spaces, or areas within a building (i.e. restrooms, stairways, room numbers, kitchen, mechanical, etc.). They are not required for informational or directional/wayfinding signs. To be safe, we would always recommend contacting thetoll-free ADA Information Line at 800-514-0301, as specific ordinances may apply to the area you live or operate your business in. Where to purchase ADA signage from? We’d love for you to give consideration to Office Sign Company! With a team of experts in designing & manufacturing braille signage, it’s been our pleasure to outfit numerous buildings across the nation with compliant signage to help them pass inspections. You can view a full list of our standard ADA offerings here (/ada-braille-signage.aspx) or contact us at service@officesigncompany.com to provide you custom braille signage offerings. Why should I be concerned with ADA signs? Because you can be fined up to $75,000 by the Department of Justice for your first violation. Seriously. Also, by incorporating braille signage throughout your office or workplace, you are doing your part to make a society a better place by increasing accessibility for individuals with disabilities. For more information related to the requirements of ADA signage within your office, we would encourage you to visit https://www.ada.gov/ to further your understanding. Now, on to the nitty gritty of what makes a sign compliant with ADA regulations. Many variables must be considered when ordering your braille signs, including color, font, size, text, and more. Please review the below image, and the explanation, to have a better understanding of the major ADA Braille Sign Requirements. Material: Any rigid, non-glare finish, material. Most commonly, we use ADA plastic, wood, or metal. Thickness of Material: Most commonly, the base material will be 1/8” thick (though we’ve seen both 1/16” and ¼” thick base material used, too). The tactile lettering is required to be 1/32” thick. Braille: Braille must be dome shaped (not flat or pointed), precisely sized and spaced, contracted as Grade II, and be in lower case except for proper names and acronyms OR when serving as the letter in a room number (i.e. B12). Colors: There must be contrast between the lettering and the base of the sign (light characters on dark background, or vice versa). Note: we discuss some color recommendations in our ADA Recommendations section below. Pictogram Height: Pictograms, the raised symbols on the sign, must be in their own 6” high field. Lettering Height: The height of the lettering on the sign must be between 5/8” and 2”, with a minimum of 1/8” spacing between letters. Sign Spacing: You must have a 3/8” minimum margin around all raised elements of the sign (pictogram, lettering, and braille), and a 1” high space is needed for each line of braille. Line spacing (if your text takes up multiple lines) should be within 35-70% of character height. Braille Spacing: Braille shall be 3/8” to ½” below last line of text. Fonts: The font that is selected must be sans serif (examples listed in ADA Recommendations below) and entirely uppercase. Font also must not be overly bold, condensed, italicized, etc. The maximum stroke on a character is 15%. Office Sign Company ensures that all of our standard braille signage offerings are ADA-compliant, and if there are ever concerns on an order that is placed, our art team will reach out to correct these issues. In instances where text requires being put on two lines, we may have to enlarge the overall size of your sign to allow it to fit. With any inquiries on braille signs being ordered from Office Sign Company, please contact our customer service team immediately by emailing service@officesigncompany.com or calling (701)-526-3835. Thank you! Having years of experience in creating ADA Braille Signage, we understand that equipping one’s workspace with compliant signs can be quite the large undertaking. For that reason, we wanted to compile a list of some recommended materials, colors, and fonts below for you to expedite the process on your end. If you’d like to see a proof of an ADA sign with these variables being used, please fill out our Request a Proof form (link) to receive a visual representation of what your signage would look like prior to ordering. Base/Background Material: ADA Plastic, in 1/8” thickness. 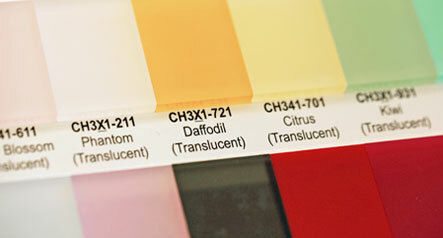 Plastic manufacturers, understanding the needs of the sign industry, have prepared matte plastic material that will help pass inspections, and offer an increasingly vast list of color options as well (link to color chart page). This material is what we use for 99% of our ADA signage, and still allows you to choose brushed metal surfaces, solid color surfaces, partially translucent surfaces, and more. You can’t go wrong with the selection and material quality of the 1/8” ADA Plastic material. Tactile/Lettering Material: For tactile lettering, we recommend 1/32” ADA Plastic with Adhesive. The adhesive layer on the backside of this material will keep your lettering stuck to the base/background material, and the thickness of this material satisfies compliance inspections. Also, there are quite a few color options for this material. The only thing to remember is that your tactile lettering color choice must contrast with the background material (common pairings are: Black with White, Black with Silver, Navy and White, etc.). Braille: For the braille beads, you’ll have a few different color options to choose from, including clear, white, and silver. Our recommendation is white or clear because they are typically a lower expense, and a bit more subtle (drawing less attention to the braille for those who don’t require it). For more options, or to see how your text would look in a variety of different fonts, please access our Font Choices tool (/sign-fonts.aspx) or contact our art team at artwork@officesigncompany.com with any questions! Colors As noted, some awesome plastic fabricators have been able to select a variety of great matte color options for ADA material that will work for your signage. Shown below are a variety of options for you to pursue. If you have any questions, or if you’d like to see other colors, please contact our service team at service@officesigncompany.com or by calling (701)-526-3835. *Note: you may need to contact your local or state municipality in the event your signage falls outside of the DOJ 2010 ADA Standards. Click Here to view the complete list of ADA sign color choices. © 2019 - Office Sign Company - Conference Room Signs, Door Signs & Name Plates.